Starting with last Sunday’s big game at Croke Park, the winners Dublin looked dead and gone with seven minutes left to play and there was something similar in the Minor decider where Tipperary were shock winners after looking beaten as the game went into injury time. Dublin won the Senior game after being certain to lose when, after a very close and bitterly fought 65 minutes of play, they found themselves four in arrears. In that deciding 68th minute Dublin substitute Kevin McMeniman raced through to score a tremendous goal and there was only one point in it. That goal inspired the Dubs and strangely for the team with all the tradition behind them, Kerry wilted. Two more Dublin points followed as Kerry faded and though Kerry did come back to level at 1-11 each, a free in the 72nd minute gave Dublin ‘keeper Stephen Cluxton the chance to score the final point and Dublin had won in circumstances that few would have bargained for. Kerry fans must be wondering how their team failed to close out a game that seemed to be safely in their grasp. Did the old hands in the Kerry team tire to such an extent that they had nothing left in the closing minutes? Certainly the game had been a war of attrition until then and though it was never a dour battle like the Dublin- Donegal semi final had been there was nothing conceded by each group of players until that stage. The four-point lead that Kerry built by the 65th minute surely had decided the issue but that McMeniman goal changed everything. It was one of those fairy story finishes that defy understanding, with the better team over sixty five minutes losing out. It was the same in the Minor decider that saw a Dublin team that had been very much the better until the final minute were undone by a late, late goal and lose to Tipperary by a point. However such surprise endings do happen and the fact that Dublin won for the first time since 1995 and Tipperary won the Minor title for the first time in 77 years has been welcomed by all who wish to see the trophies being spread around. This weekend sees the climax to our own domestic season with first the Senior Football final taking place on Saturday. 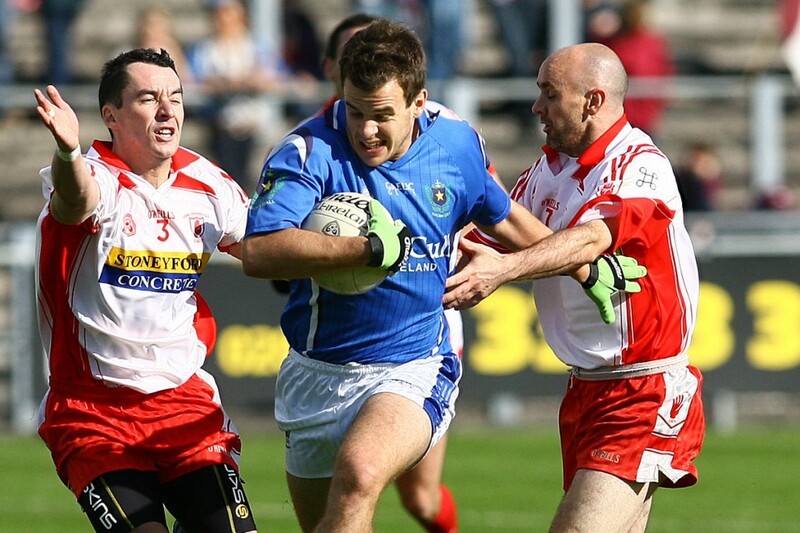 St Gall’s will be favourites to beat Lamh Dhearg simply because they are the dominant football club in Antrim. The club have won eleven titles since 1990 and even added an All Ireland Club title and they face a Lámh Dhearg team that have had to battle to make it as far as this. Lamh Dhearg have won two Antrim Senior titles in their history, in 1971 and 1992. What Lámh Dhearg have going for them is the infusion of great young players from their team that won the last Ulster Minor Champions Tournament, players who will in time see more Senior titles come to Hannahstown. On Saturday they will surely go out and give their all but it has to be doubted if at this stage they can beat such a battled-hardened team like St.Gall’s, who so far this season have shown that they are as good as they were when winning an All Ireland title. St Gall’s for 2011, Lámh Dhearg for the future. The Antrim Senior Hurling Championship will be decided on Sunday, between holders Loughgiel and Cushendall. Neither team this season has been in top form, especially Cushendall who were extremely fortunate to overcome Division 2 St.Gall’s in the semi-final. On the other hand Loughgiel are a side that on many occasions failed to come up to the mark in finals, losing six in a row before winning last year. Cushendall on the other hand seem to grow into a different team on Final’s day. I find it hard to plump for either side because both come into this game with questions over them. By the time you are reading this you should know who will be in charge of our county senior hurling team fort the incoming season. There are three applicants for the position – Dinny Cahill, Jerry Wallace and John Crossey. There was a feeling around towards the end of this season that Dinny had done as much as he could in his two spells as manager and perhaps it was time for a change. Two years ago Jerry was a selector alongside Dinny but on this occasion he apparently wants the top job for himself. I know Jerry Wallace made a great impression on the squad during that year, but was it Dinny or Jerry that drove the team on to that win over Dublin in last year’s qualifier? Despite his record of service to Antrim hurling I cannot see John Crossey being named. Our executive are making efforts to make the Championship weekend something different this year as it probably will be the last finals to be played in the ‘old” Casement before the big refurbishment begins. On Friday at Casement Social Club Gilbert McIlhatton will give a lecture on the history of the GAA in Antrim (6.30pm) followed by a GAA themed table quiz (7.30pm). On Saturday there will be a parade of juveniles from all our clubs prior to the throw in of the St Gall’s-Lámh Dhearg game. All our followers should find something to interest them.